Jakob Salvati, Emily Watson and Michael Rapaport star in the war drama Little Boy. An eight-year-old boy is willing to do whatever it takes to end World War II so he can bring his father home. The story reveals the indescribable love a father has for his little boy and the love a son has for his father. MPAA Rating: PG-13 for some thematic material and violence. “Little Boy” is a powerful and moving film about a little boy who is willing to do whatever it takes to bring his dad home from World War II alive. The heartwarming story will capture your heart and lift your spirits as it reveals the indescribable love a little boy has for his father and the love a father has for his son. 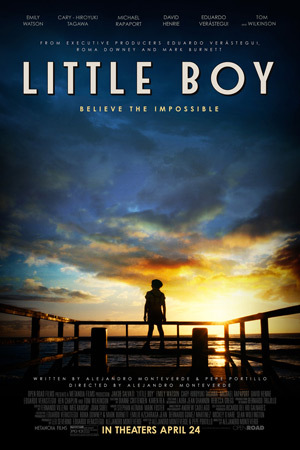 Set in the 1940s, “Little Boy” is an instant cinematic classic that captures the wonder of life through the eyes of a 7- year-old little boy. Written and directed by Smithsonian Institute Award winning director Alejandro Monteverde, “Little Boy” highlights themes of faith, hope and love in the face of adversity.